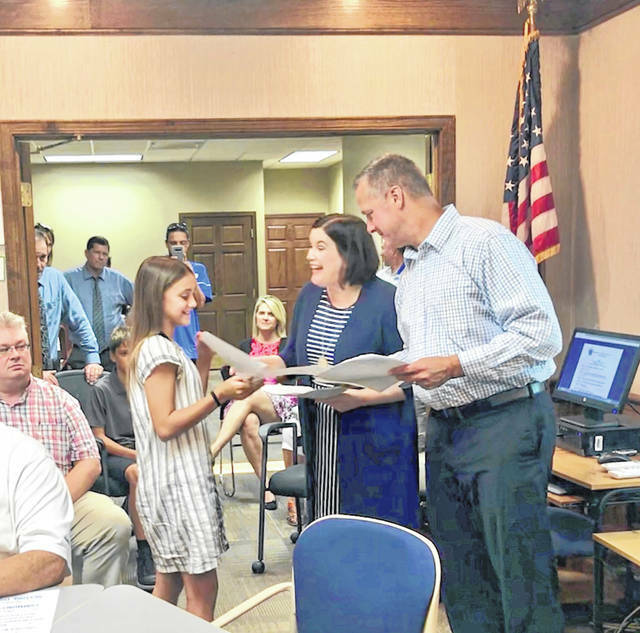 The Washington Court House City Schools Board of Education honored students recently who scored perfect scores on Ohio’s state tests. Each student was met with applause as they were introduced and presented with certificates of achievement and a copy of the district’s “Together We Have Purpose” cultural road map by board president Jennifer Lynch and vice president Craig Copas. Washington Court House City Schools students honored for academic achievement included Kasie Bryan, Garet Creamer, Lynnon Haines, Quinton Marine, Kylie Yeazel, Drew Aills, Noah Haithcock, Leah Marine and Kentaro Yamazaki, William Miller, Jillian Frederick, Gabriel Perez, Maggi Wall, Maggi Wall, Siddhi Patel, Panth Shah, Graden Johnson, Yukino Nagakura, Draven Shadley, Caroline Frederick and Sam Shaffer. 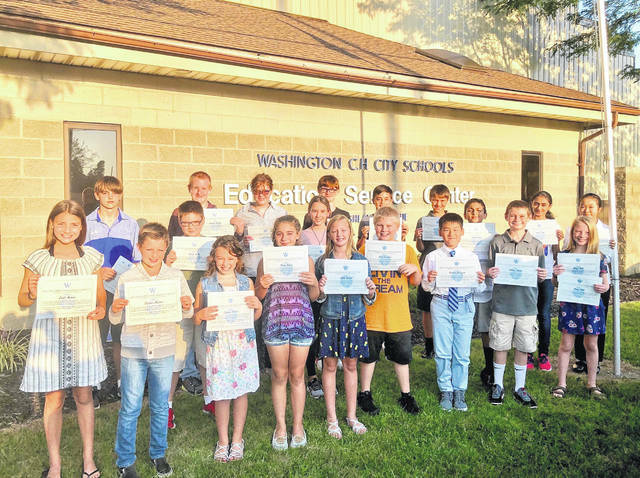 The Washington Court House City Schools Board of Education recently recognized 20 students for earning a perfect score on the 2018 AIR Assessment, part of Ohio’s state testing. It was standing-room only at the board meeting as proud parents and guardians packed the conference room of the central office to see their students be honored for academic achievement. This end of the year assessment is given to students across the state from third grade to high school, in subjects varying from English language arts to math to science. According to a press release from the meeting, each student was met with applause as they were introduced and presented with certificates of achievement. Additionally, they also received a copy of the district’s “Together We Have Purpose” cultural road map by board president Jennifer Lynch and vice president Craig Copas. https://www.recordherald.com/wp-content/uploads/sites/27/2018/09/web1_IMG-6185.jpgThe Washington Court House City Schools Board of Education honored students recently who scored perfect scores on Ohio’s state tests. Each student was met with applause as they were introduced and presented with certificates of achievement and a copy of the district’s “Together We Have Purpose” cultural road map by board president Jennifer Lynch and vice president Craig Copas. https://www.recordherald.com/wp-content/uploads/sites/27/2018/09/web1_IMG-6184.jpgWashington Court House City Schools students honored for academic achievement included Kasie Bryan, Garet Creamer, Lynnon Haines, Quinton Marine, Kylie Yeazel, Drew Aills, Noah Haithcock, Leah Marine and Kentaro Yamazaki, William Miller, Jillian Frederick, Gabriel Perez, Maggi Wall, Maggi Wall, Siddhi Patel, Panth Shah, Graden Johnson, Yukino Nagakura, Draven Shadley, Caroline Frederick and Sam Shaffer.